Illustrations of various guns. 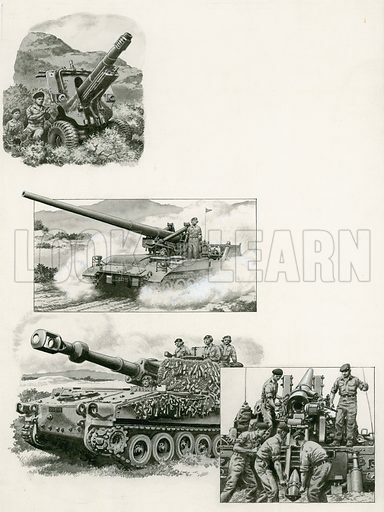 From top to bottom: The British Army's italian designed 105 mm infantry howitzer in the early 1970s, which fires shells at a high angle; below and bottom right, the 175 mm self-propelled gun, the heaviest used by Britain in the early 1970s; bottom, British 155 mm self-propelled howitzer, a very effective "tank killer" and artillery support weapon. Original artwork for illustrations that appeared on p26 of Look and Learn issue no 543 (10 June 1972). Available worldwide for immediate download up to 4,516 x 6,020 pixels.